Just remember: all the hard work you put in at the beginning will be fruitful. Once you have a few deals under your belt, it becomes much easier to get funding, but until then you may need some help. 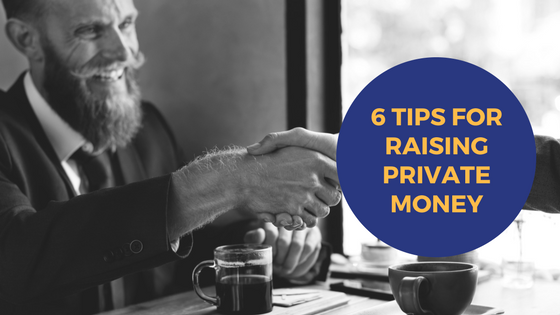 Here are 6 tips for raising private money for your real estate deals. One of the best ways to raise private money is to talk to people you already have a relationship with. You’d be surprised at how willing people will be to help you if you already know them and you just reach out. Additionally, you should always attend local real estate club meetings and networking meetings to gain a trustworthy reputation. Real estate clubs often provide free meetings and training, so you’ll be killing two birds with one stone. Make sure people know that you’re a real estate investor and that you have a real estate investing business. You might feel like a broken record, but make sure everyone knows about your business. Everyone. Your friends, doctors, neighbors…don’t make assumptions about who can help you invest. When someone asks you what you’ve been up to, or how work is going, it’s an open door to talk about what you do. Most people will be curious about what you do and ask questions. Some might be willing to connect you with resources. People love to do favors. Document everything. You can’t imagine how much this will help you in the future. Accurately document the details of each purchase, rehab, and sale so that you have a foundation to establish yourself as a safer investment to private lenders. Doing this will also give you a sense of how much money it takes to fund each aspect of a deal. In the long run, being detail-oriented brings other benefits as well. If you make a mistake on one project, you’ll be able to look back at the documentation later to see where things went wrong and prevent it from happening again in the future. Lenders will be very happy to see this kind of mindfulness. This might sound counter intuitive, but start by using your own cash. This will force you to really think hard about each decision and where each of your dollars is going. You’ll quickly learn how to be proactive with your strategies and this will help you know how much funding you’ll need in the future. Don’t have enough cash to get started with a deal? Start saving. Be frugal and save as much as you can. If real estate investing is truly your goal, you really should make this commitment. Lenders love to see newer investors with some skin in the game—it shows them you’re truly serious and committed to your success. This is one of our favorite tips: look for opportunities to teach people about private lending. This will position you as an expert and help potential lenders to trust you. It’s very important for lenders to have a sense of security in their investment. If they see that you’re knowledgeable they’ll be much more likely to help. On top of that, teaching others can actually help you find new private lenders. Many private lenders don’t have prior experience in real estate and aren’t familiar with the idea of private lending. A lot of them are willing to be a private lender, they just simply aren’t familiar with the process. Once potential lenders are educated about real estate investing, it won’t take much to get them thinking about private lending. Make sure they understand the benefits of private lending compared with traditional forms of investing (ROTH, etc. ), and you’ll surely pique their interest. When you’ve done a few deals successfully, don’t be afraid to talk about them. Showcase them on social media and begin sharing at networking events. You’ll want to draw attention to yourself as a successful investor to gain the interest of others in the industry. Just be careful not to advertise. There are SEC laws in place that don’t allow this. Don’t go around looking for money or saying you’re funding, because that can get you into big trouble. For more information about what you should avoid saying or posting, click here. If you haven’t done any deals to give yourself credibility, you can establish trust based on people you know. The people in your sphere of influence, like family, friends, and co-workers, can go a long way in establishing trust and credibility if they know you as someone who is reliable and trustworthy. Be sure to include this information in your credibility kit if you don’t have a lot of successful deals to show to potential lenders. There’s no script or formula you can follow to raise money. Focus on building relationships versus getting money quickly. Just because someone doesn’t want to lend you money doesn’t mean you shouldn’t put an effort into forming a relationship with them. You never know what connections they have and who they could set you up with in the future. When you network, pay attention to what the other person is saying and make sure you listen and ask questions. The last thing you want is for people to think you only care about yourself. Put yourself out there and talk about your business, but show that you’re interested in the other person’s life and business as well. What are their goals? What kind of relationship would be beneficial for them? What kind of services could you provide that address their pain points? Even if you haven’t done any deals yet, it’s still possible to start up a successful real estate investment business using a private lender. Start with your own cash and keep meticulous records of everything you do so that you can establish yourself with lenders. Talk to as many people as you can to find resources, and educate others about the private lending process. Don’t be shy about discussing your successes because it’s a great way to get lenders interested in you. Above all, focus on the bigger picture of building solid relationships with people who will not only help you find private money, but will help your real estate investment career in the long run.